Conekt Gadgets has entred into India’s accessories market. 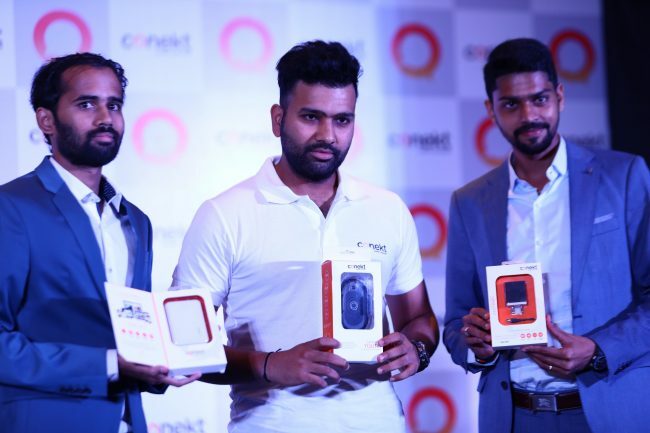 In an event in Mumbai, Rohit Sharma, an Indian international cricketer unveiled the brand and launched range of products. These products include: Zeal Series – Power banks, Dash Series- Wall chargers, Ace series – Data Cables, Youth Series -Car Mount, Chick Series – Earphones, Verve Series – Car Chargers and Elan – Wireless Charger. The Zeal series of power banks have ergonomic design and claimed to offer superior grip with minimum weight and offers 2A output capacity. They also have features of smart charging, high durability and over charging protection. The Chick series of earphones have stylish look and come with light in weight ear-pins that create a super secure fit and have a powerful bass. The Elan is a sleek and compact wireless charging solution that features the latest in wireless technology to provide wireless charging directly to Android and IOS devices. It is light in weight and has a smart breathing light indicator that helps in power saving. The wireless charging base features a rubberized, non-slip finish to ensure proper placement of devices charging. It also allows high-speed wireless charging efficiency up to 70%. The Youth Car Mount is hands-free and has an adjustable stand, automatic lock and unlock feature, infrared sensors and anti-scratch silicon surface. It has an anti-slip grip for the smartphone without any magnets. It works with phones of all shape and sizes. The car mount also comes with the feature of wireless charging. It has a suction cup that one can attach to the dashboard and even the wind shield. These products will be available across all the leading retail and online stories from 20th August 2018.